PRESS RELEASE: Upper Basin Plans Large New Dam/Reservoir On The Colorado River? Upper Basin Plans Large New Dam/Reservoir On The Colorado River? Colorado River, USA: Today, the “West Slope Roundtables” in the state of Colorado are meeting to discuss issues related to Colorado’s use of Colorado River water (the agenda is here). One of the main items on the agenda is the “Colorado River Risk Study” which analyzes and predicts the likelihood of the Colorado River water supply system collapsing and Lake Powell being drained due to ongoing drought and climate change. 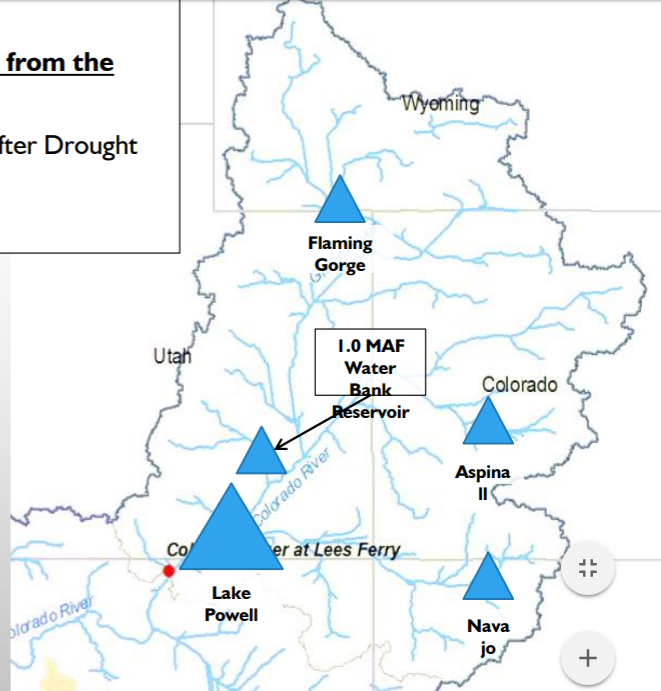 The study also proposes various ways to mitigate the problem including draining upper basin reservoirs into Lake Powell, “demand management” in the upper basin (decreasing water use), as well as a new idea — building a large new reservoir to “bank” water in the upper basin. At the meeting, a presentation will be shown in which a large new dam/reservoir — around 1 million acre feet — is built above Lake Powell in Utah. The presentation (posted here, slide 26) places the reservoir on the Dirty Devil River near Hite, Utah, just above the confluence with the Dirty Devil and the Colorado River. The reservoir would presumably be used to store (“bank”) upper Colorado River water to be released into Lake Powell to try and keep the level of Lake Powell high enough so the hydroelectric turbines at Glen Canyon Dam can continue to operate. President Obama and the Colorado River! Save The Colorado River Update: Movies, Jewell’s and More!